“And what should I do in Illyria? “And Hoxha did good and bad, but built 700,000 bunkers across our country of Albania”. It was possibly the most astonishing and depressing fact too, in an astonishing but only sometimes depressing day. It deserved a bit of the Borat treatment as well, from that ‘Cultural Learnings of America for Make Benefit Glorious Nation of Kazakhstan’, as our coach snaked up the Albanian coast to the ancient citadel of Butrint. Leaving behind the six story hulk of Cunard’s Queen Elizabeth Cruise liner, monstering it in the charmless port but more beautiful bay of Seranda. Which USA Today included this year as one of the top 10 undiscovered cruise destinations. We were making for a citadel anyone interested in history or civilisation simply cannot afford to miss though, especially at 56 Euros. But as our tour guide Davina, trained in the Albanian Capital of Tirana, spoke of the facts of her country and the place where ‘Our Dictator’ was born too, Enver Hoxha, in part of that all or nothing attempt at Tourism, you wondered if she might joke that if you didn’t like the food they’d be attaching electrodes to your privates or, if you did, selling you their younger sister. Hoxha’s 45 year rule may have brought rapid economic growth and improved literacy too, but it was notorious for the suppression of opposition, detainment camps and the use of the death penalty. No such horror stories now, on an easy day out from Corfu, forty minutes on the hydrofoil. Although to me packaged coach tours (lunch included), are always depressingly ‘Communistic’ somehow. With the dodgy looking bloke in the white jacket overseeing us, that very human tendency to behave like sheep and the few Euros guided carefully from your pockets via the unnecessary early restaurant stop. 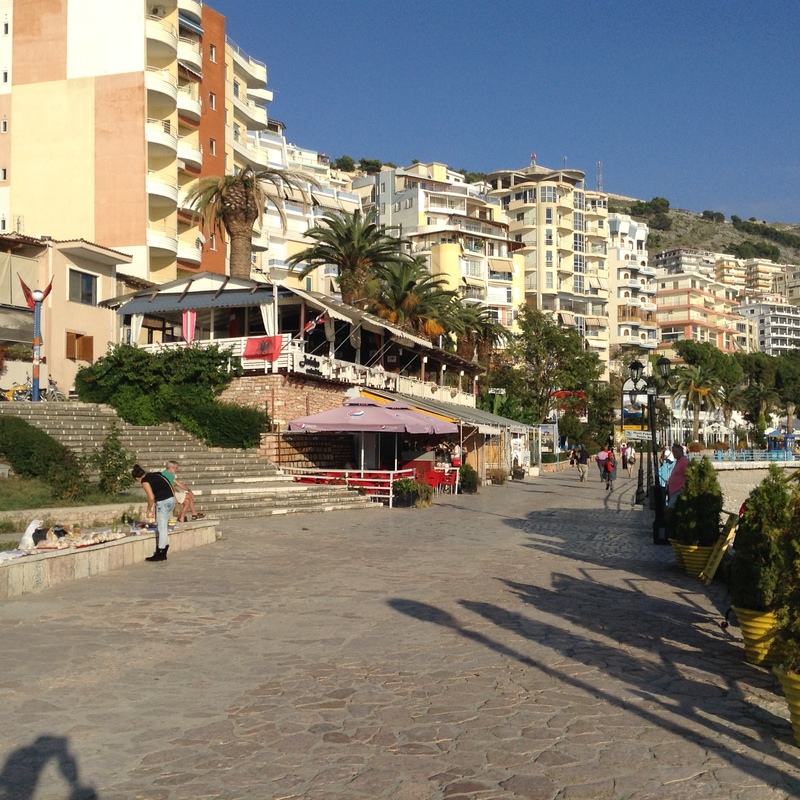 In a town that is winning more tourists – the guide said 80,000 to Albania as a whole, although most to the riviera are Greek or Italian – but which is a skeletal facade of dreary half-built breeze block hotels and empty bars, that may well harm future tourism, and the faint sproutings of small ‘International’ businesses. Nearby Corfu’s charm is it’s living history, its style, it’s comparative complexity, while Sarande’s lack of it is its functional emptiness. Yet when you see how little there is around, you forgive the simple packaging, and enjoy the ride and views, especially with the glorious weather that October brought here, which forgives so much. So to dispense quickly with any depressing bits; Albania’s obvious poverty, especially compared to thriving and culturally rich Corfu, the romany shanti-towns on the reasonable roads, the lack of any skilled artisinal crafts to bring anyone real ‘Suvenir’ sales, over cheap plastic tourist tat, unlike all those crafts in Corfu’s old town, and the rubbish strewn not only on the verges but at supposedly natural oases too. Or the little girl begging at the coach, you see in London now too, and, at a harbour restaurant where all the moulded plastic chairs seemed to have broken their backs, the bruising looking guy in white socks who almost threatened to buy me a drink, to try and talk to me. “Where you from?” It might be no different in any struggling port, but I had just seen ‘Taken’ on TV. Then I felt guilty at the stereotyping of Albanians, so common across the water in Corfu, and on mainland Greece too, where something like a million emigrated after those iron ‘walls’ came down. In the old days the searchlights roamed the straights at Kalami and the small Albanian town beyond Seranda that means six, from the six mile gap of water, and people were shot too. While the husband of an English friend on Corfu had his boat stolen to be used by Albanian drug runners though, and crime has tarnished the image of some of whom have made it into the Greek Middle Classes, of course desperation and economic migration have happened a great deal in Italy recently as well. Then to revelations though, only to underline my ignorance – that Albania, which uses the Lex, is Muslim, for instance, although its Communist past ruthlessly suppressed any faith. The guide defined it as 70% Muslim now, 20% Greek Orthodox and 10% Catholic, pointing at the church and simple hilltop mosque, as if atheists and agnostics had been eradicated in the new Dawn. She assured us folk live here in peace and intermarry easily too. Not much was said of Albania’s year long Civil War in 1997 then, although if I had a Euro for the number of times the guide used the word privatised, I could probably do a lot to help the Albanian economy. How different the terrain on the mainland is to Corfu though, with those expansive, now half-drained and cultivated marshlands, where Gerald Durrell went hunting as a child and recorded it so elegiacally in “My Family and Other Animals”. From the coast, Albania is a four tiered hunchback of steep mountain ranges, feeding the many rivers that bring an astonishing variety of trees, giant bull-rushes and burgeoning flaura and fauna, among the dusty scrubland, burned by the Mediterranean sun. So we were quickly on the edge of the new 86 Square kilometer National Park and lake Butrint, ringed with half submerged cages for the huge mussel production here, in the brackish half-salt, half fresh water lake. The whole landscape suddenly seemed to glow a kind of electric mauve-green, dancing with vibrant, healing colours. Colour and light are the things I’ll remember the day for most, a draw to artists and water colourists for centuries. Like the Frenchman Dupre, and the limerick-writing Edward Lear, who came here in the 19th Century, along with those celebrated Grand Tourists, like Lord Byron himself. It pleased the Finnish Construction engineer, who had turned to painting and natural photography instead. 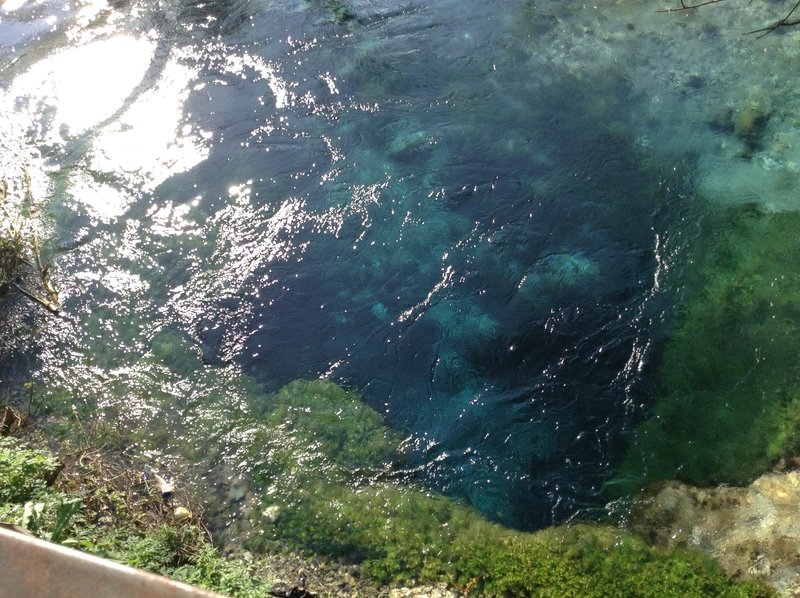 Not least in our visit to the ‘Blue Eye‘, a bubbling natural spring that rises from more than forty metres through solid rock and is the visible source of the Bistritza river. When you’ve nothing you always make too much of something, perhaps. 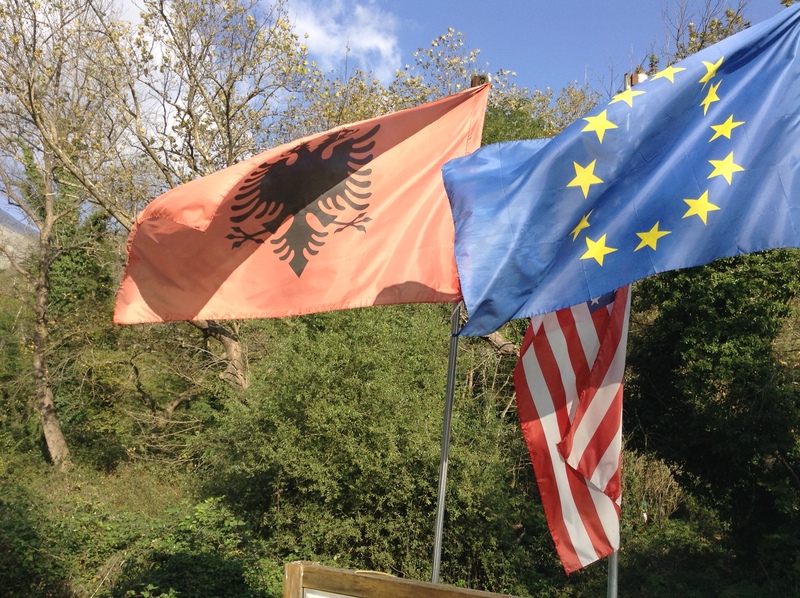 So the simple eco-cabins tried to compete with the broken down saw-mill and abandoned boats, or the Double Eagle of the Albanian flag, black on red, fluttered humbly but hopefully by the US and EU ones. Then Unesco’s intervention to define a world heritage site also helped create the national park. 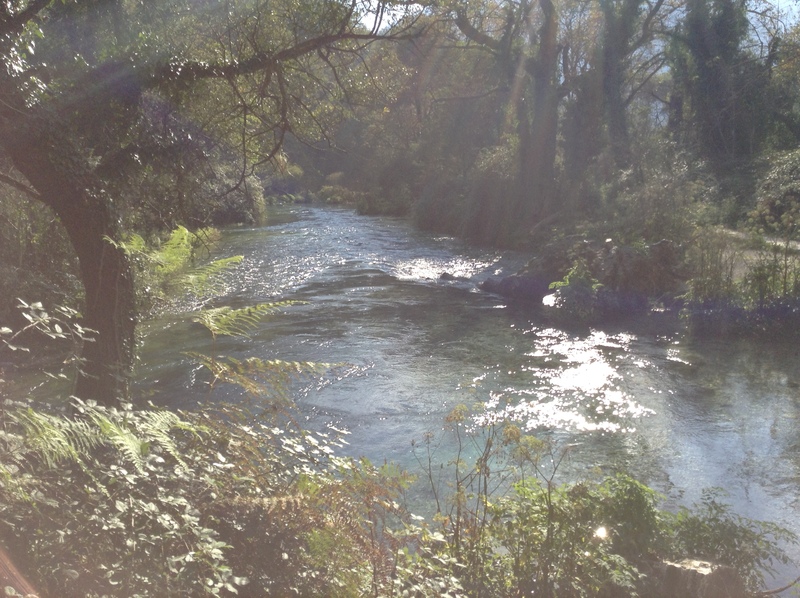 At first I wondered if the 40 minute excursion was worth it, for these ‘Naturalistic Learnings of Free Albania’, but that water is so pure it seems made of glass and in the afternoon light it suddenly looked as if you were gazing across a holy river in India. Perhaps above all though came the revelation that this is claimed to be the land of the ancient Illyrians, proud soldiers and master shipbuilders, which vaguely competes with the miserable image of modern Albanians, not least to many Greeks, as dirt poor Armenian peasants. “What do you call an Albanian peasant?” someone joked, “An Albanian.” So to a natural diversion though and that quote from Shakespeare’s Twelfth Night, when Viola is shipwrecked and believes her brother Sebastian has been drowned. “What country, friend, is this? – This is Illyria, Lady.” Whether Shakespeare ever traveled literally or not, his very English plays were vitally informed by the stories, legends and histories flooding into a Renaissance London, that also had very practical experience of seafaring and piracy in ‘Europa’, as England exploded as a maritime power in the late 16th Century and started competing with the likes of Venice. I believe the start of so much that is still not enough understood in the beginnings of World and American Capitalism. Of course Illyria, like Bohemia in The Winter’s Tale, is chosen as a place of exotic difference, for it’s mystery and otherness, to welcome and test a foreigner in a strange land, as Shakespeare usually proves himself a friend of strangers. Perhaps also as a kind of creative gateway to that dominating imaginative landscape inside Shakespeare’s mind and education though, before science had herded the forces of Psyche and Eros into the clothes of modern psychology – ancient Greece and classical Rome. ‘What Country, friend, is this?” is exactly the point of so many of Shakespeare’s themes, inner and outer. One that Greeks might not take for granted either, considering the disparate ethnic histories here and their own Nation only being founded in 1830, as Albania was in 1913. Yet the literary point for someone living on Corfu is that Illyria perhaps adds a bit of credence to the tale Gerald’s brother Lawrence’s scholastic friend relayed in his own little travel gem, Propsero’s Cell, claiming that Corfu was the magic isle that Shakespeare had in mind for The Tempest. I still think Shakespeare’s greatest bark was his avid reading and all assimilating imagination, devouring the patterns of storytelling and myth, that ran like a river through trading London, while the magic of Shakespeare’s isle is really his own art. But that imagination ranged so often back to this world, not only in Twelfth Night and The Tempest, but in Timon of Athens, A Midsummer Night’s Dream and A Comedy of Errors, that you start to wonder. Like the marshes though, at times it could all be taken for Elysian Fields. 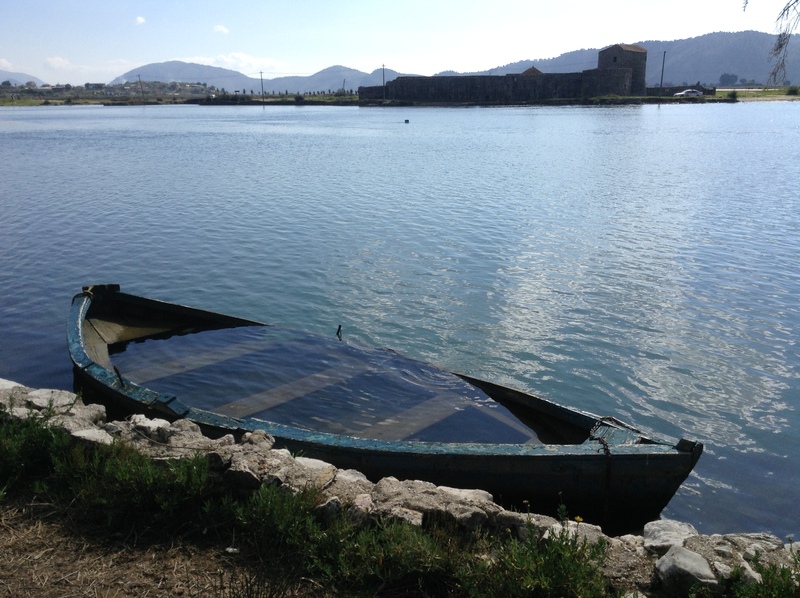 First in the day we had made for Butrint though, by one of the castles of Ali Pasha and the old rope ferry over the canal, sparking in the sunlight, to discover the remains of so many days. 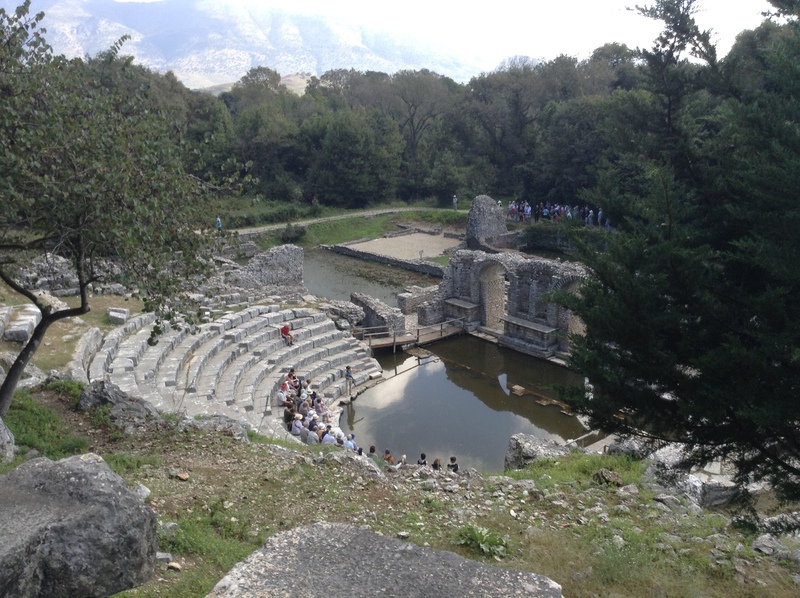 Perhaps it is because Butrint is such a microcosm of competing civilizations and changing, impossible time. With its re-positioned doric columns rising in front of the sturdy Venetian tower, Butrint was a wonderful revelation for me. Only touched by visiting Epidavros, or the much under-rated port of Ostia outside Rome, that so tops treking even the Forum itself. The acoustically perfect little amphi-theatre here was re-built by Roman settlers, under Julius Caesar, who established a Roman colony eleven years after he had invaded Britain. So the original Greek Agora and Acropolis (hilltop City) expanded, beyond the huge 4th Century BC ‘Caeclopean’ walls that began the fortified settlement. Which you can also see in Etruscan fortresses in Lazio, like the one above Florence in Fiesole, as well as original settlements in Mycaenean Greece. To remind us that everything lasting began with fortified towns, before Nations or Ideologies, with tribes and City States. So to the Roman period though and those heads unearthed here of different kinds of dictators, that makes it all a more seamless and intimate tapestry. Like those of Augustus and Livia in the museum, that became as common and recognizable symbols as the Holy Family, or as an important a meme as the coinage. Then came the building of a pillared Baptistry nearly a half a millenia later, once Constantine had turned Rome to Christianity. With a very natural ‘Christian’ mosaic circle, sporting birds and flowers and animals, sadly covered at the moment by sand to protect it. The large Basilica too, which originally meant a kind of market and meeting place, rather than a Church. As a side note, it was fascinating too to find that Partridge as an early Christian symbol also used here, related to work at Phoenix Ark Press on that carol, the 12 Days of Christmas, and a Partridge in a Pear Tree. Like Shakespeare reaching back to the psychic source of the Gods though, it was the original remains that had the most power to me. 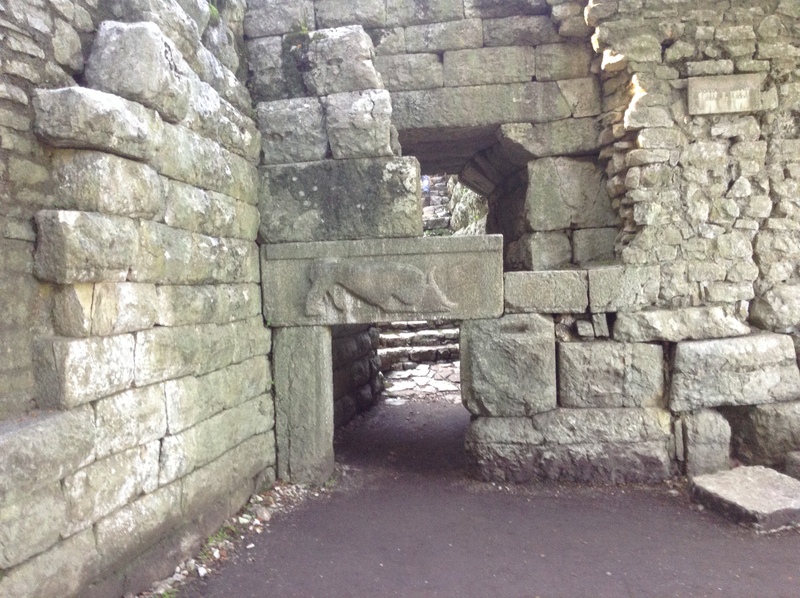 Like the fine stone gate on the edge of the sleepy, lime blue and green lake, almost a secret scar in the rock, a magic doorway, that Virgil perhaps immortalised in the Aenead. Was it really here then that Aeneas himself, Trojan emmigree and mythical founder of Rome, after that 10 year war over a woman, landed on his way to Italy, in a still mythic world, that understood history as storytelling in a struggle between eternal fact and the needed journey and qualities of any individual life? – “I saw before me Troy in miniature, a slender copy of our massive tower…and I pressed my body gainst a Scaen Gate.” With that competes the much later carved gateway that at first I thought depicted a Wild Boar, but which is in fact a lion, devouring the head of a bull. Butrint’s name actually means Wounded Ox though, when the Greek foundation supposedly saw an Ox let ashore and killed by another animal, to prove auspicious omens. The city was also mentioned by Cicero though, after a friend with a country villa near here complained about Roman development and urged him to lobby against it in Rome, who in his letters wrote “Let me tell you that Buthrotum is to Corcyrca (Corfu) what Antium is to Rome…the quietest, coolest, most pleasant place in the world.” It shows how lively Corfu was at the time too. For all the interest of the monuments though, and despite the aging guard in his overblown outfit blowing on his whistle as if Dictatorship had no tomorrow, or the fascinating artifacts in the little museum, so depleted by thefts in 1997, Butrint has something else that could wake Keats to his greatest song – “Thou still unravished bride of quietness, that foster child of silence and slow time………” It is the enchanted setting, on a sparkling day, wandering through sylvan groves blooming with wildflowers, edged by that wide blue-green lake, lifting with herons, as a fisherman tilted dreamily at the waters with his rod. Resources of fish were one of the reasons for the place’s ancient economic importance, though with those mussels Albania has other exports, like the wine on display in plush bottles in one of the port bars. For all the coachloads too, which must be far worse in high summer, you can hang back and find a space off beaten tracks to contemplate those vanished ghosts, of fact and mind and time. It is exactly what would have appealed to that 19th Century imagination obsessed with ‘the fragment‘ too. 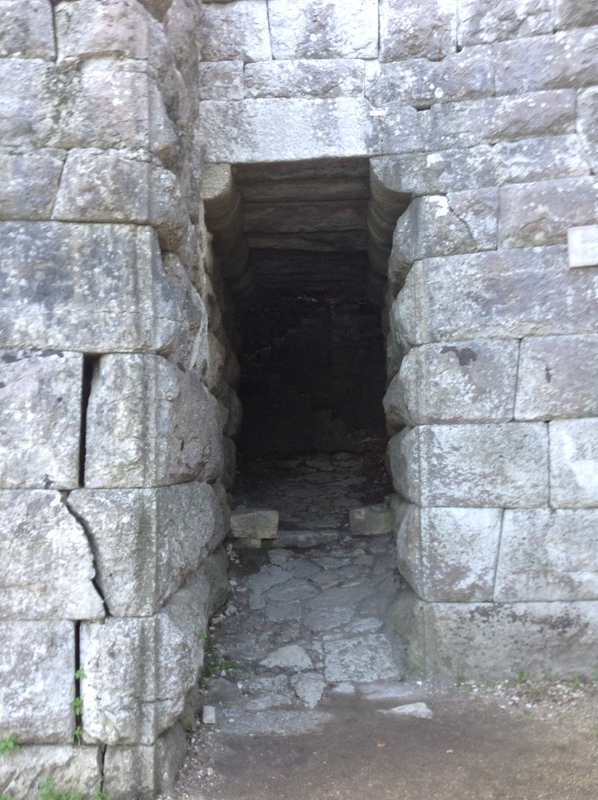 Those many ravished fragments of Butrint, crossing so much time, were picked out for me most in the sacred well of Minerva, bound by the hard rock, as firm as hope. Then the discovery of a Nympheum, a temple to those Nymphs and Dryads that sported through an ancient imagination, when Gods and Goddesses were living in everything. Then, to prove this was a City of Nymphs, by another well they found some Roman graffiti, in the achingly moving little dedication by one inhabitant “Julia Rufina – lover of Nymphs.” The painted head of Dionysus adorns one of the Nypheum’s alcoves, although I would take issue with the guide that he was just the God of Wine, rather than of natural Ecstasy and a transport to the Divine, unlike his debased Roman counterpart Bacchus. Of course those super efficient conquerors and engineers, the Romans, stole everything from the ancient Greeks, except the Aqueduct and the Arch. But there was an older ‘religion’ here then, since 400 years before Chirst Butrint was a votive centre to the healing God Aesclepius. Where real sacred snakes, to wind symbolically around the staff of the Cadeucus too, were kept in pens and laid on the stomachs of the sick to induce dreams. As those wrestling with life and mortality took baths and visited the theatre too, a sacred space, as Shakespeare knew it was a sacred space too, and a place of artistic magic, even in hungry, entertainment driven, Reformation London. 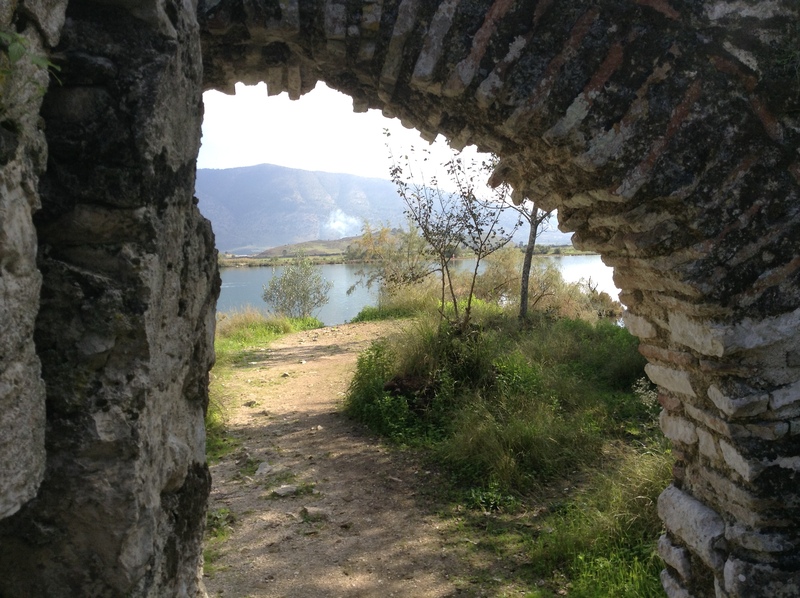 Everyone came here though, from ancient Greeks, to Romans, to Byzantine Greek Christians, Ottomans, Venetians, the gruesome but effective Ali Pashi, by which time Butrint had near vanished under the mud and topsoil, to bad old Enver Hoxha. Who closed off Albania completely, as paranoia saw him building all those pointless concrete bunkers. Then that fear and militarism deep in the Soviet psyche too has a very long history among regional warlords in the Balkans. Forget it. Time is trying to and if they had the money in Tirana, or could persuade either some philanthropic Oligarch or Unesco, they should pour in as much money as they can to exploit its archaeological heritage, in the best sense. 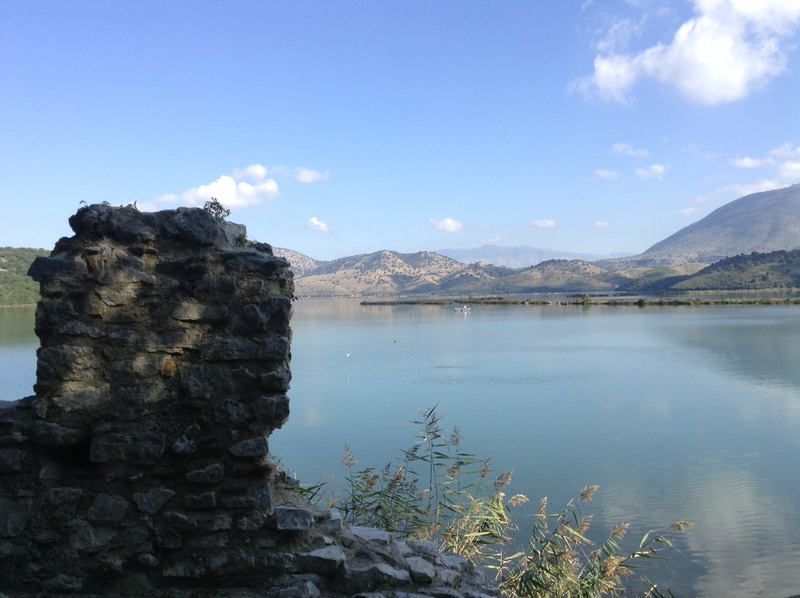 Only 60% of Butrint has been excavated, for instance, and the ancient town of Finiq, obviously linked to those tribal and seafaring Phoenecians, hardly at all. Come to think of it Phoenix Ark Press has to discover the etimology of the Phoenix and whether there is any link. Yet before Hoxha was even fighting in the mountains as a Partisan, or Mussolini made Albania as cheap a conquest as Abyssinia for his Fascistic dreams of Ancient Rome and invasion of Greece, Italian Archaeologists had begun to uncover the City again, in the twenties and thirties. What a glorious experience it must have been for those archaeologists. Mussolini renamed Seranda Port Edda, after his favourite daughter, who turned against her father on the execution of her husband, Count Ciano, and fled to Switzerland. To sell her husband’s diaries to Alan Dulles and the Chicago Daily News. It is written up at Phoenix Ark. In fact Hoxha, from an important local family, crucially linked Archaeology to the creation of Albanian National Identity. He and the Fascists too were wrong though thinking it provided any convenient truth, in that such sites really link the movement of peoples across deep time, and the long process of real Civilisation. It could be an even more powerful gateway to tourism then, if uncontrolled building doesn’t ruin the riviera and they learn the charm of real local family bars and restaurants. But Albania has something else shared by Greece, Bulgaria, up into Romania too, perhaps Romania above all, that reaches back to the nature worship of the ancients. Namely astonishing natural scenery, wildlife that includes wolf and bear and some of the most pristine but now threatened forests in Western Europe. It is exactly why the Albanians must try to keep an enlightened and open blue eye on its wounded ox of a country, shutting tight in Seranda, if it is to develop and change, as it might. But they also need to remember too that real prosperity has a far deeper and wider meaning that just the ‘Capitalist’ discovery of quick cash. As the T-shirts saying ‘I Love Albania‘ flapped unconvincingly in the breeze then, the guide was cheerful, jokey but half apologetic, suggesting it would all be better in a few years and then those mosaics might be on display too. Like the man who apologised when I gave that little girl some Euros, or the waiter doing his damndest to offer good service, but looking rather small. Then there is a shame in that negative image of Albanians, its down-at-heelness and its recent past. But a great deal has changed too and in ‘Six’ families and kids were doing what everyone does, going to school or playing in playgrounds. 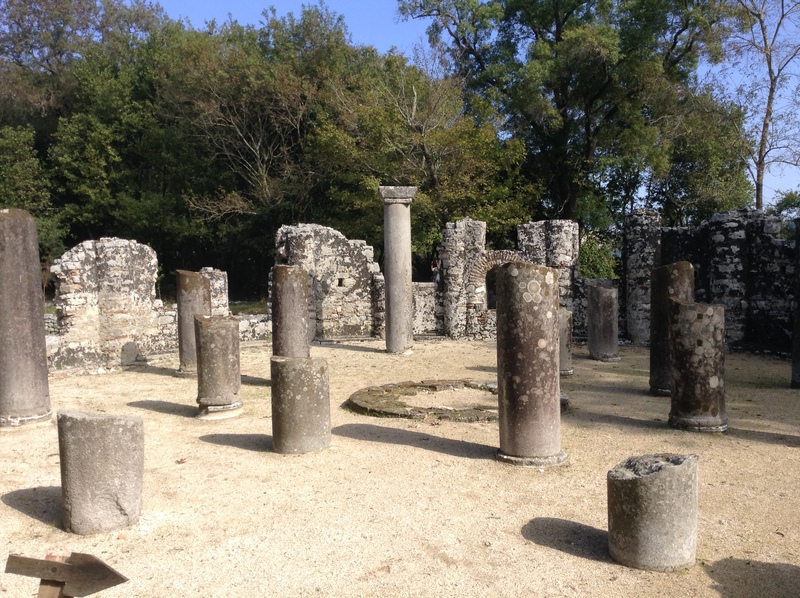 Then the collapse of Communism opened another vital door to Butrint too and saw more archaeological work up to 2005, which has spruced up the museum and produced a National Park. More understanding and proactive engagement might come from Greece too, despite its own woes, meaning perhaps Greek efforts too to open up and make capital from a heritage where many people’s have intermingled for so long. Though the girl leading me to the hydrofoil was quick to point out she was part of the Greek Albanian minority, a community that revolted before the First War, and the association of religion with ethnicity has caused such harm around the world. As for Butrint, of course nothing especially important to the Greek lady who shrugged and said ‘it’s just a pile of stones’, to make my hair curl and remind me of an American who had said exactly the same thing years ago passing under the Lion Gate in Mycenae. No, it is not just a pile of stones, it is literally one of the theatres of everything, so related to that healing son of the Sun God, Apollo, for those you like their sun worship intense. Where votive shrines to pure and natural wells first sprang up, as all settlements spring from rivers and clean waters. So came the burgeoning of trade, thought, literature, philosophy, and a symbolism that refers to everything still: the theatre of Gods and Man, the theatre of art, the theatre of magic and medicine, sadly the theatre of war too. It was only getting the Flying Dolphin back though, as the sunset burned the big white ships in Corfu Port a fiery bronze, making them look as if Vulcan had returned them to their smelting yards, that the full significance of Corfu’s Venetian Fortresses came into view in my head. Not so much on the tip of the Eastern headland, but the old Fort with its square, lionine eye to the little island of Vidos, and to Saranda and Butrint just beyond. Because it was dominating the straights of Corfu that was the key to shipping and trade, the gateway to the Ionian, and why the Venetians bought Butrint in the 14th Century to straddle those straights like a Colossus. Venice did so too, even as the Ottomans held Albania, Turkey and ‘Greece’ in their grip for five hundred years, at times pushing to the gates of Vienna. Until Napoleon marched into that “Drawing room of Europe”, St Mark’s Square, and the Venetian Empire came to an end, then the Balkans convulsed into the politics of ethnic hatred. Meat to remind you too though of the threats and unreformed horrors of now, and how significant that fall of Byzantium was in 1485, when Memmet II stamped his unreformed Islamic shields on the walls of the Hagia Sophia in Constantinople, today’s Istanbul. Then Monotheistic Religion is like Communism, it attempts to impose an absolute truth, which is why it should be separated from the State. Except perhaps that religion of the ancients, when the Gods were a reflection of the psyche of humans, good and bad, but magic forces lived so deeply in nature too. But so a fascinating and profoundly colourful day came to a close, back home on Corfu. In the end making me feel that if they keep that blue eye clear and open, this part of Albania and Butrint National park especially, could long be the quietest, coolest, most pleasant place in the world. The photographs are in Copyright to Phoenix Ark Press – They show Lake Butrint, The Port of Seranda, The ‘Blue Eye’ spring, Bistritza river at its source, the ancient amphitheatre in the Temple of Aesclepius, the pillared circular baptistry, a fragment of lake and city, the ancient gate Virgil may have described as ‘Troy in Miniature‘, the later ‘Lion’ gate, the Albanian flag and a submerged boat opposite one of the little castles of Ali Pasha.